Live From SXSW: Wolfram’s Computational Approach to Ed. That’s the question Stephen Wolfram, the renowned British computer scientist, asked toward the end of his presentation at the South by Southwest Interactive Conference (SXSW) in Austin, Texas, on Sunday. He had just shown an audience the various ways his computation systems work, most notably and recently the Wolfram|Alpha answer engine, which turns simple language into complex data and visualization. For instance, if you type “washing machines” into Wolfram|Alpha, you don’t get the top websites for buying washing machines, or even a Wikipedia page. 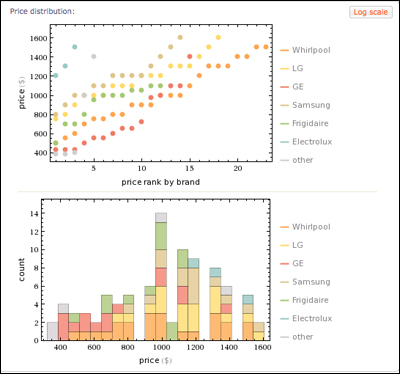 Wolfram’s algorithm spits out a breakdown of cost by brand, product listings, and graphs of price distribution. For Wolfram, the short answer to the question above, as it relates to education, seems to be: More. By doing the basic understanding, data-gathering, and fact-finding for students, computation frees teachers to work with them on problem-solving and deeper understanding. Wolfram is primarily known for the Mathematica programming language and software, used religiously by computer scientists and college students, and for creating the framework for Siri, Apple’s voice-recognition software. But he’s turned an eye toward K-12 education in recent years, trying to create a learning environment that bridges data with human experience. Through a publishing imprint, Touch Press, Wolfram offers interactive e-textbooks on tablets. In January, Wolfram launched the Wolfram Education Portal, a website of math course materials, interactive textbooks, and widgets. An interactive algebra textbook aligned to the Common Core State Standards is offered for free through the CK-12 platform, an online repository of open math and science textbooks (co-founded by Neeru Khosla, whom I interviewed earlier in the week). Wolfram’s algebra lesson bypasses some of the steps students typically take to get to an answer, in favor of having them go further once they get there. As he noted at SXSW, his systems can “solve homework problems cold”; I got the sense that Wolfram’s idea of “homework” would fall somewhere short of changing civilization overnight. It’s an controversial approach that focuses less on what students know and more on how they process information and how they can get the information they want. This is a debate about more than just technology; it’s about what should be important skills for a modern student to have. Does the student need to be an expert in computing the slope of a line in order to be an expert in graphing? There are exceptions to Wolfram’s concept of deeper understanding, though, most notably in the humanities and liberal arts. As he demonstrated Sunday, when you type in the name of a Shakespeare play, you get a breakdown of the most-used words. How that can lead to greater understanding of the text is unclear. It will be interesting to see how Wolfram|Alpha and the education portal, which is in beta, are going to evolve. Wolfram gave the crowd a preview of how his answer engine will incorporate the social Web, producing visuals about your Facebook friends’ hometowns, for instance. He also hinted at creating a product around “computational news” that will tell you what’s happening in the world based on your personal data. Microsoft’s Akhtar Badshah Reflects on STEM Ed. in the U.S.